Tis the season! It’s time to give holiday flowers! There are so many beautiful choices for gifting. What will it be? Blossoms in a classic or contemporary color? A floral arrangement featuring flowers in a traditional or totally modern shape? Anything goes, because it’s the thought that counts, of course, and because you simply can’t go wrong when giving flowers. Poinsettias are favorite flowers for Christmas. They usually come in red, but they look stunning in white, cream, pink and marbled colors. Poinsettias are flowers that typically have 3 to 5 blooms bushy blooms, making your gift seem rather substantial. Their pots are often already wrapped in red shiny paper too. 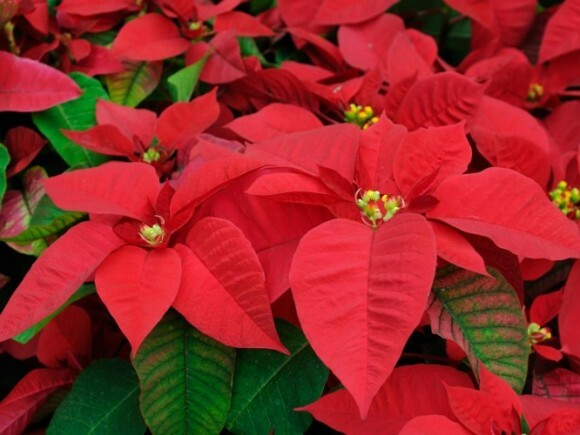 A word of caution, poinsettias are toxic to animals. Grocery stores, nurseries and farmers’ markets sell mini Christmas trees during the holiday season. Sometimes, they’re versions of pines or firs, but occasionally they’re simply rosemary plants shaped like the iconic tree. Mini Christmas trees are fun to give when they’re adorned in little glass balls or a glittering garland. You can make a festive little Christmas arrangement yourself by placing Hypericum berries in a clear vase, along with gorgeous holiday greens. The combination is timeless and elegant. Your giftee will surely love the present enough to display it and admire it for the weeks ahead. Other holiday flowers you can give this year include Candy-Striped Amaryllis, Paperwhites and White Asiatic Lilies.